Not long ago, when English-style perennial gardens were all the rage, annuals fell from favor. But now they’re making a comeback, as savvy gardeners rediscover the important role they play in beds, borders, and containers. As season extenders, annuals are unsurpassed. When summer- and fall-blooming perennials die down, cool-season annuals kick into gear to fill gaps between established plants. There they’ll grow and bloom through winter until their crescendo in spring. If you don’t have room for lots of plants, you can still create dramatic effects. Even pocket gardens and containers pack a lot of flower power. Oakland landscape designer Bob Clark is a master at combining annuals with other garden plants for color. Buy plants with flowers in single colors, not mixes. 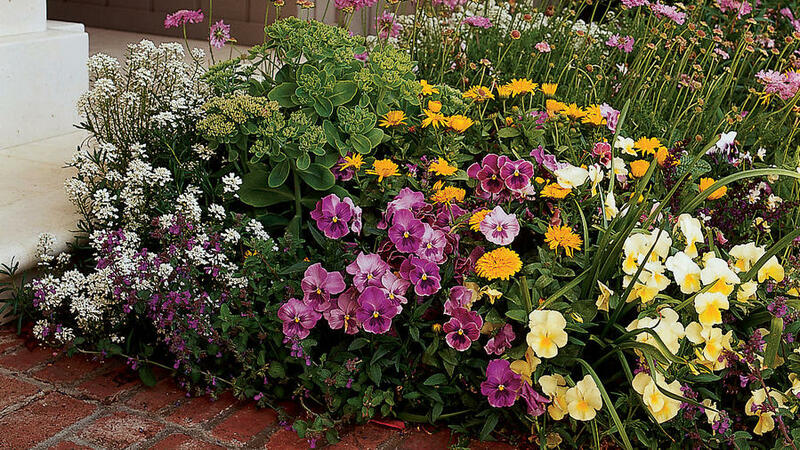 Mixed colors often impart a garish or spotty look to garden beds, unless they’ve been specifically bred for compatibility (like Antique Shades pansies). Single colors, combined with your favorite similar or contrasting colors, have more impact. Consider bloom time. When do you want your major show of blooms? For winter bloom (in mild climates), mix in plenty of calendula, pansies, primroses, or violas. Annuals like godetia, nemesia, and schizanthus bloom in spring. For a long season of bloom, combine plants that peak in both seasons. Don’t forget foliage. To create a foil for flowers, Clark uses annual leafy vegetables (cabbage, lettuce) and herbs (fennel, feverfew, parsley) with interesting textures and colors. Since most cool-season annuals (particularly winter-blooming types) are short, some of these plants―especially fennel and mustard―also provide height until later-blooming tall flowers emerge. Consider the “visual pace.” Gardens viewed up close allow for more complexity; plantings seen by passing motorists will be more effective when simple. The hot and spicy colors in this front yard in Piedmont, California, aren’t for everyone; it takes courage to put on such a bold show. In early spring, bright orange flowers contrast beautifully with foliage in deep purple, dark green, and lime green―with tall red and yellow tulips as accents. “It’s a busy garden, but the masses of orange make it work,” says the designer. Mild-climate gardeners needn’t pine for snow in winter. It’s easy to create the look of a light dusting of snow―all frosty and cool―with an all-white planting. Designed for a long season of bloom, the planting shown here covers a two-tiered rock retaining wall. Primrose and cyclamen tucked among the stones bloom from fall through spring. Bacopa, a perennial accent, provides the lacy white flowers around them (it freezes back below 28° to 30°). Come late winter, white narcissus pop up through the garden, and by spring the garden is in its full glory. White-flowered Chrysanthemum paludosum and Loropetalum chinense fill the center pot. Although Carole Kraft specializes in perennials, she finds that annuals are her mainstay in winter; they provide abundant color when perennials are dormant. Climate zones are taken from the 2001 edition of the Sunset Western Garden Book. Bachelor’s button (Centaurea cyanus); 1–24, H1–H2. Canterbury bell (Campanula medium); 1–9, 14–24. Chinese forget-me-not (Cynoglossum amabile); 1–24, A2–A3, H1–H2. Corn cockle (Agrostemma githago); 1–24. Made for the shade, florists’ cineraria adds intense color to dark corners of the garden. Here it’s combined with asparagus fern in a 15-inch-wide glazed terra-cotta pot. Florists’ cineraria (Senecio x hybridus); 16–17, 22–24. Flowering cabbage and kale; all zones. Forget-me-not (Myosotis sylvatica); 1–24, A1–A3. Sweet alyssum (Lobularia maritima); all zones. African daisy (Dimorphotheca); 1–24 (best in warm-summer climates). Calendula (C. officinalis); 1–24, H1. Chrysanthemum (C. multicaule); 1–24, A1–A3. English daisy (Bellis perennis); 1–9, 14–24. Foxglove (Digitalis); zones vary by species. Iceland poppy (Papaver nudicaule); annual in 7–9, 12–24; perennial in 1–6, 10, A2–A3. Pansy (Viola x wittrockiana); all zones. Petunia (P. x hybrida); winter annual only in zones 12–13. Poor man’s orchid (Schizanthus pinnatus); 1–9, 14–24 (best in 1–6, 15–17, 21–24). Primrose (Primula); zones vary by type. Shirley poppy (Papaver rhoeas); 1–24, A1–A3 (best in cool-summer areas). Snapdragon (Antirrhinum majus); 1–24, A3. Sweet peas (Lathyrus odoratus); all zones. Globe candytuft (beris umbellata); 1–24. Chrysanthemum (C. paludosum); 1–24, A1–A3. Viola (V. cornuta); all zones.